I'm triggering both an RF and a canon 6d (connected with a v6) with a v6. When I hit shoot the camera and flash both fire but the flash is hitting before the shutter. Even if exposure is 5 sec. The end result is no flash is captured as it is flashing before the exposure. Bump sorry really want to know if there is a solution. Could you check if your V6 (Receiver unit with the flash) has enabled the DELAY function? Which flash model are you using? Is the correct flash profiled selected? Is flash set to TTL mode? Thank you and I look forward to hearing your testing results. Are you remote triggering the camera with a V6 receiver attached to it? In this case you have to set a delay on the V6 receiver connected to the flash. A camera always has some shutter lag which must be compensated with a flash delay. An easier approach to remote triggering the camera while using flash is to use the relay mode of the V6. Have a look into the manual for how to use it. Relay mode of the V6. That fixed the problem. FYI I was using the RF60. 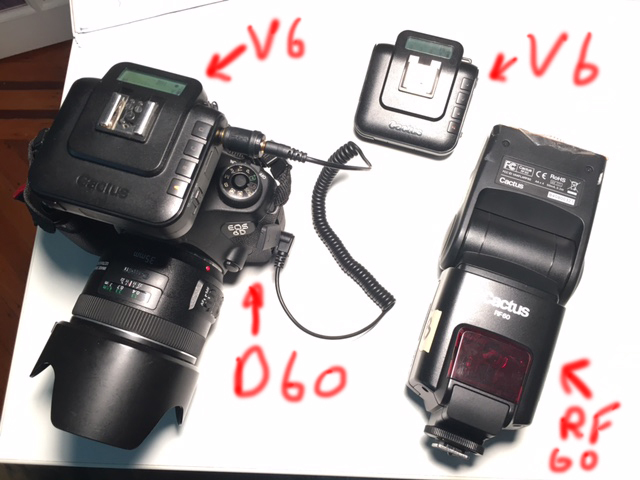 Once again I'm trying to fire my canon d60 and a Cactus RF60 flash remotely using a v60 mounted on the camera and a v60 as the transceiver. I used this about a year ago and was able to get it to work with using Relay. I can't remember the set up but for the life of me I'm not able to get it working again. Does the camera take a shot when you full press on V6 TX's Test Button? Have you tried setting the lens to Manual Focus? Check the distance between the TX and RX V6 unit. If you are holding the TX close to the camera, set the WORK RANGE to Short. Try changing to other channels in case there's a signal interference. Thank you and let us know if the above helps.